Several years ago (probably over 20!) I got a Cadbury’s Crunchie bar at a birthday party I went to. I decided I didn’t want to eat it so I gave it to my grandpa. However, he forgot to take it home with him so I held onto it until the next time I saw him. For a while afterwards he called me “Crunchie” and I would always get a Crunchie at Christmas or a Crunchie Easter egg at Easter. So when it came to trying to decide what to make him for his birthday this year I decided to make Crunchie cupcakes. 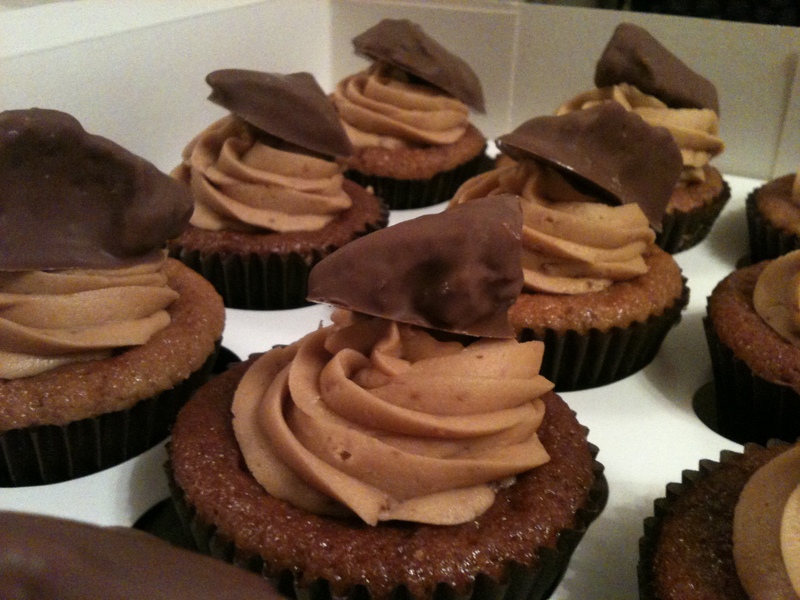 Fancy an inside-out Crunchie in cupcake form? Last Christmas Tom gave me some great presents. One of them was a “Hello Cupcake” calendar. I have the Hello, Cupcake! and What’s New Cupcake? books and I love the fun ideas in them…. and the calendar has 12 new ideas for me to try! So I have decided that each month I will make the cupcakes for that month. January’s cupcakes were shoes, which I’d already made in December (got a bit ahead of myself there – maybe I’m psychic?!) so the first ones to make were the ones for February. 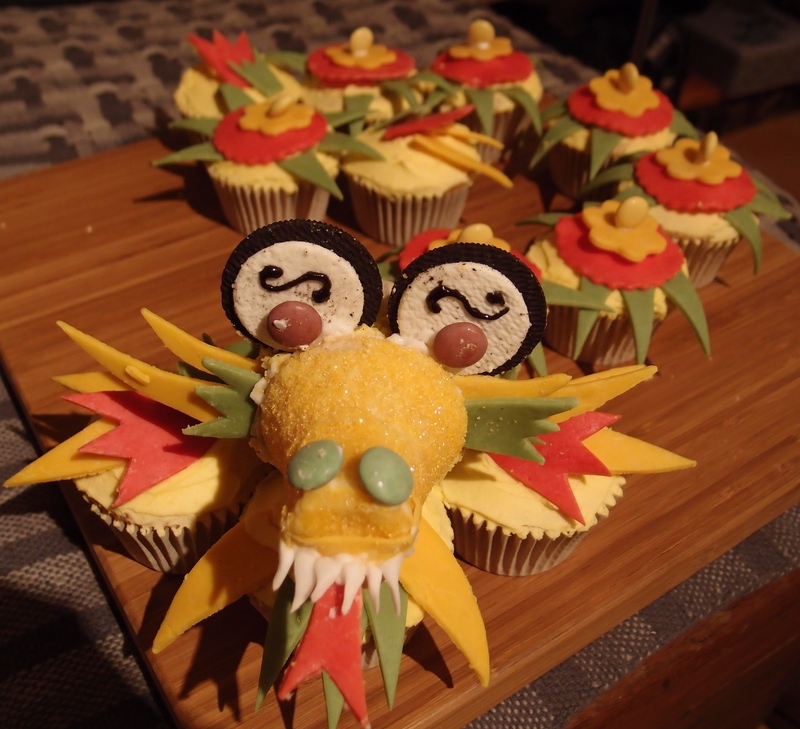 Could you eat a dragon? If so, keep reading…. A few weeks ago at work, David asked if I’d make a cake for his son’s birthday. Given how much he likes cake, my initial thought that it was probably for him rather than his son. And the more he told me, the more I thought that was the case – he asked for the cake to be 2 different flavours, one of which was his favourtite cake (carrot) and he then added that his son doesn’t even really like cake! 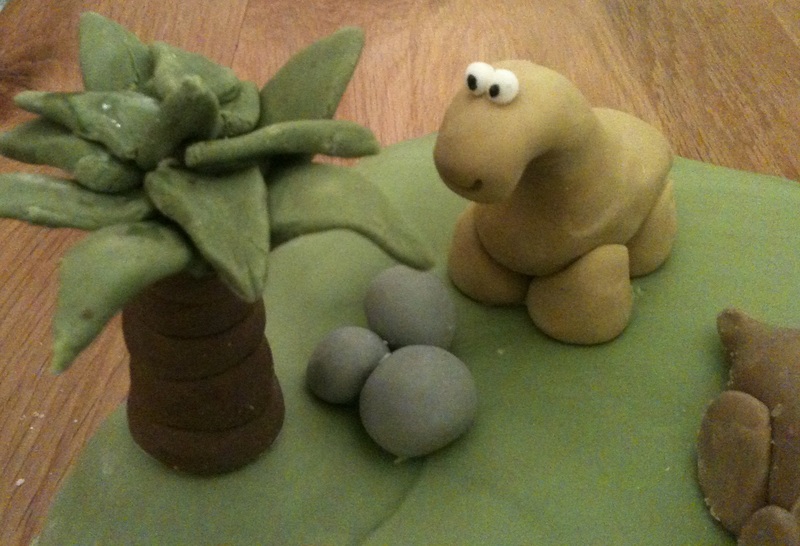 Apart from specifying the flavour of the cake and saying it had to have dinosaurs on, the rest was up to me. 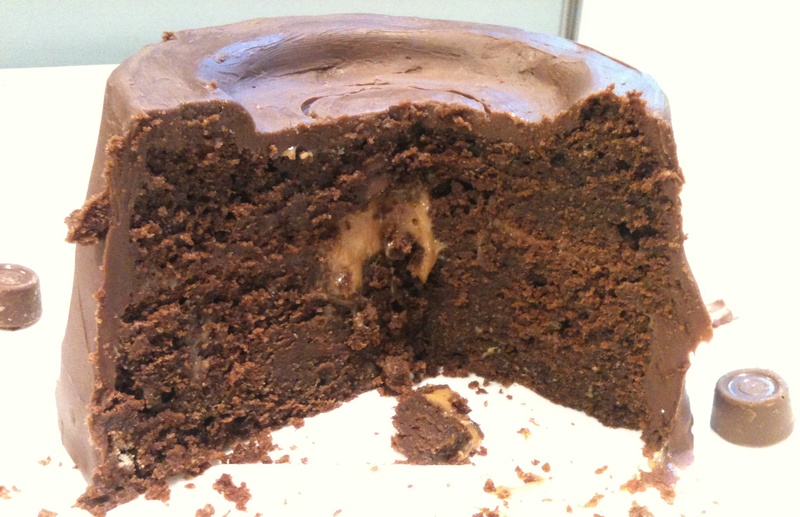 If you want to see the whole cake, keep reading. Last week I had a week from hell at work – 60 hours worth of hell. However, I’d agreed a while ago to make these cakes for a friend in the office. I didn’t want to let her down so last Thursday evening I somehow managed to fit in making them. 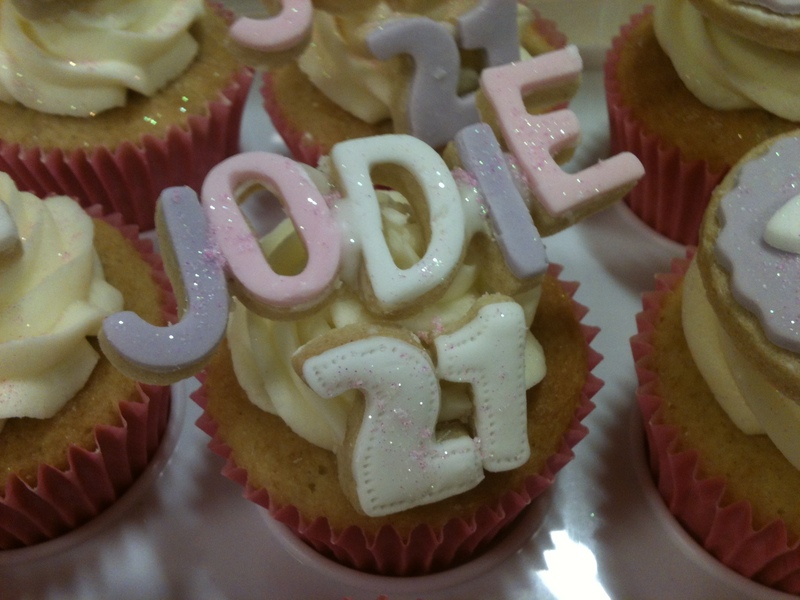 They had to be pastel pinks, purples and white, some with 21’s on, some with Jodie’s on and some with both on so I came up with a design I wanted to do. However, I was too tired to make them exactly as planned – I guess I’ll just have to save that design for another time. At lunch yesterday, I met up with Julia. She wanted to go to WHSmiths to look at cook books that were on offer so I said I’d go with her. She’s a very bad influence on me and pretty much forced me to buy another cook book – ok, maybe that’s an exaggeration… I saw the Green & Black’s Ultimate chocolate cook book with 75% off, asked her if it was any good (since she owns just about every chocolate recipe book), she said yes, so I bought it. I then had the urge to bake something chocolatey. So instead of cleaning/tidying the house yesterday evening before Julia stays tonight and my parents come up for the weekend, I made myself an early birthday cake. I’m sure Julia won’t mind (she’d much rather have a slice of chocolate cake than see a tidy house) and my parents will understand (they know me well enough to realise that I prefer baking to tidying 🙂 If you’re looking for an excuse for not doing the house work, or have an urge to make something really chocolatey, then keep reading.